Many people consider their pets to be four-legged members of the family -- and much like any two-legged member of your family, you want to keep them safe. Phifer pet screening products offer protection from insects as well as stand up to clawing and chewing from household pets. Dogs frequently claw at doors and screens whenever they want to go outside or come back inside. Over time, repeated clawing and pawing can take its toll on inferior screens. Not only does this leave you vulnerable to insects and other creatures getting inside your home, but your beloved pet can escape through a hole if it’s large enough. While most cats prefer to stay indoors, they do enjoy lounging on windowsills and often climb, claw or push against screens out of curiosity. They can tear a hole in the screen or, if your frame isn’t secure, can push the screen free from the window, allowing your cat to escape or seriously injure themselves if they fall from the window. If you live in an area where smaller critters -- like squirrels or raccoons -- frequently scurry about outdoors, these wild animals can gnaw or scratch at screens from the outside. And if you have pets, your dog or cat may get excited and claw at the screen to try to get to them, too. 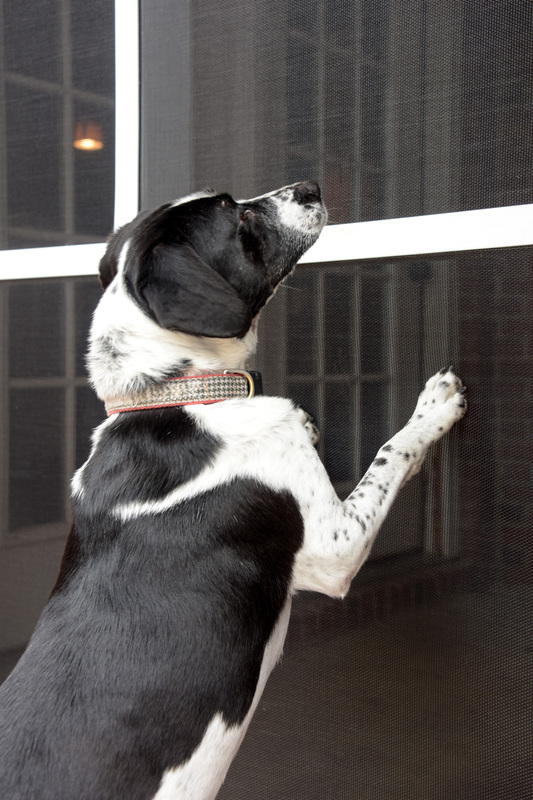 Our pet-resistant screening is suitable for doors and windows as well as larger areas such as pool and porch enclosures, making it ideal for pet owners who want to give their four-legged friends some fresh air on the porch, without leaving them outside. Over time, the cost of having to replace inferior screening due to damage from pets or other animals can add up. As an added benefit, screening keeps insects out and minimizes exposure to fleas and ticks that can cause health problems for your pets. 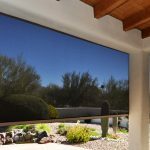 By investing in sturdy, durable Phifer PetScreen®, you and your pet can enjoy nature, without nature making its way indoors to your home. What Makes Phifer Screening Strong Enough for Pets? Whether you need door or window screening that’s tear resistant, or are looking for puncture-resistant patio screening that can withstand critters gnawing at it, Phifer screening is manufactured with durability in mind -- particularly when it comes to protection for (and sometimes from) your pet. Both our TuffScreen® and PetScreen® products are made from strong, vinyl-coated polyester. 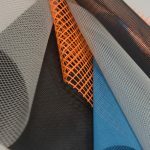 This vinyl-coated polyester mesh is engineered and woven to be tougher, more resilient and more durable. Their sturdy construction and quality of materials minimizes tears caused by pets either chewing on screening or raking claws and nails against it. 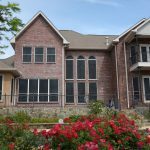 For superior strength and sun protection, our SunTex® 80/90 screening is not only pet resistant but also ideal for pets that spend a lot of time on enclosed porches or near windows. 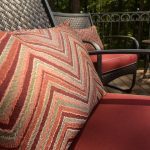 Made from durable, finely-woven vinyl-coated polyester, this screening material blocks 80 to 90 percent of the sun’s rays from entering and overheating your home -- or overheating your pets and putting them at risk of heat exposure. SunTex 80/90 is also antimicrobial, mildew resistant and fade resistant, requiring only a little soap and water to clean and keep it looking new for years to come. While some pet owners enjoy building dog houses or cat trees for their cherished family pets, they certainly don’t enjoy having to replace screening that was torn by Fido or Fluffy. However, if you happen to be handy or enjoy DIY projects around the home, replacing torn screen with Phifer pet-proof screening materials is surprisingly easy. 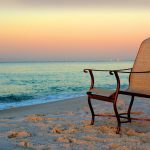 And given the strength and durability of our screening, it’s a DIY project you’ll only have to do once every few years! Looking for some inspiration, check out some of our DIY videos, including this one on how to replace a screen door using PetScreen. If you’d prefer to leave your home improvement projects to the professionals, be sure to ask for Phifer products by name to get the quality, pet-resistant screening you need to keep your home free from bugs and to keep your pets safely indoors. Whether you choose the DIY route or a professional install, take our quiz to find out which of our screening products is right for you. You can also check out our screening selection guide to narrow down your choices. Whether you decide on doing it yourself, or enlisting the aid of a professional, be sure to ask for Phifer products by name to be sure you get the durability and insect protection you need. We partner with a number of retailers, where you can find our products in stores or online. If you have any questions, please contact us. We’ll be happy to talk with you to learn more about the type of screening that offers you and your family the best and most durable screening with your pet protection needs in mind.